As part of their mission to improve the lives of fellow Oklahomans through a commitment to safety, for the fourth year in a row McIntyre Law, P.C. compiled a study of alcohol-related accident trends across the state of Oklahoma. 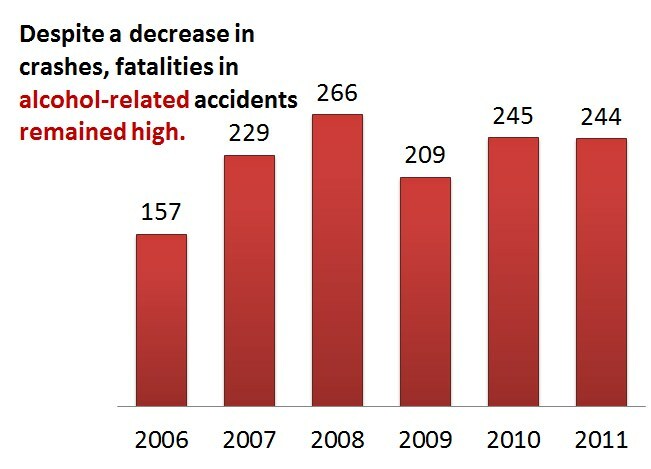 With statistics provided by the National Highway Safety Administration (NHTSA), the Oklahoma Highway Safety Office (OHSO), and the Fatality Analysis Reporting System (FARS) McIntyre Law compiled a study examining drunk driving trends over the past six years, as well as fluctuations from 2010 to 2011. Unfortunately, the data shows that while there was an overall decrease in alcohol-related crashes and injuries as a result of the, the decrease in alcohol-related fatalities have decreased by just one fatality from 2010 to 2011. Across Oklahoma, even as alcohol related crashes decrease, overall drunk driving statistics confirm that alcohol-related crashes remain deadly statewide. McIntyre Law’s research has shown that alcohol-related accidents have been on the rise since 2006. It’s McIntyre Law’s hope that by providing this information to the community, we can motivate the state to work towards increasing public awareness, and decreasing the number of tragic alcohol-related fatalities in Oklahoma each year. In 2011, Oklahoma saw a decrease of just one fatality caused by an alcohol-related accident. Crashes and injuries decreased by 203 and 92 respectively, but fatalities remained comparatively high. At 244 fatalities statewide, and a .4% decrease over the past year, fatalities remain close to 17% higher than they were just two years ago. Many rural roads do not have street lights. 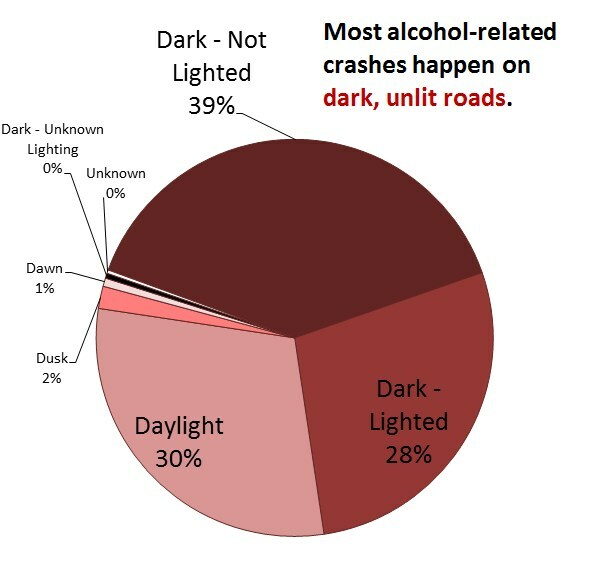 In 2011, 39% of drunk driving accidents occurred in rural areas with either poor lighting, or no lighting at all. 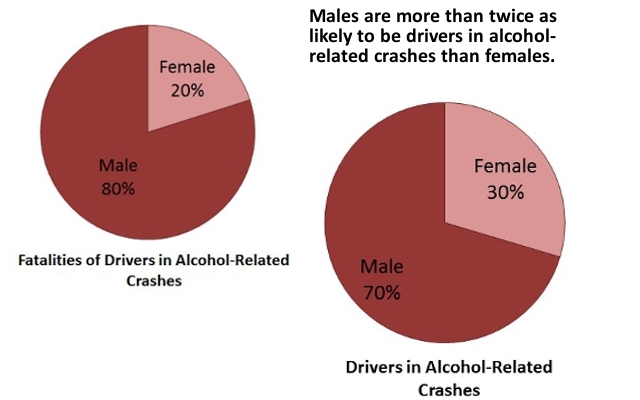 In 2011, Oklahoma drunk driving statistics showed that males continue to account for a much larger percentage of drivers and deaths in drunk driving accidents. 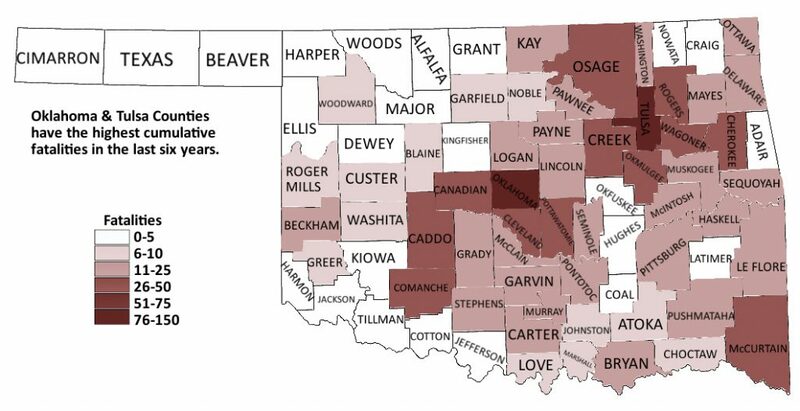 Population in Oklahoma varies widely from county to county; the counties per capita statistics accurately reflect the number of fatalities by population that occurred from 2006-2011, a number that is not kind to smaller counties with lower populations. Roger Mills County, for instance, has a population of just 3,702; with 6 fatalities over the past six years, the results are the highest fatality rate per 100,000 people in the state. 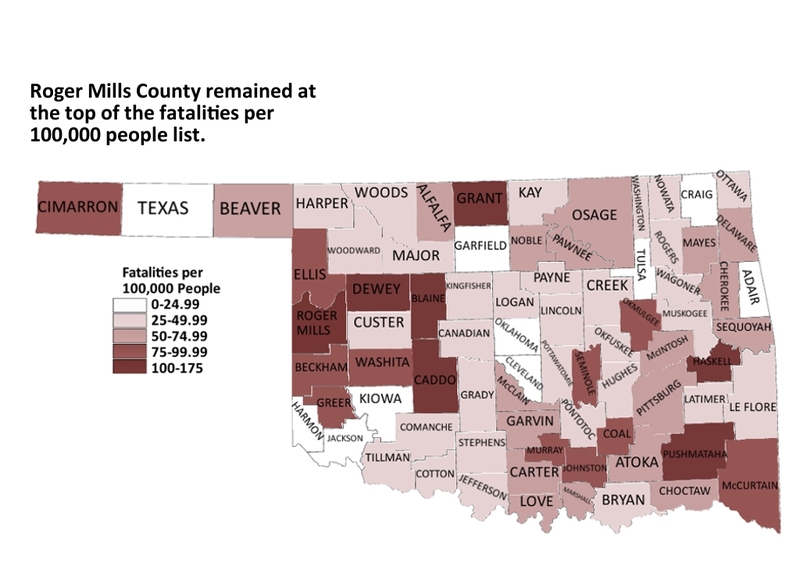 Likewise, Oklahoma and Tulsa counties both have some of the greatest fatalities each year, but they also have some of the largest populations. Their higher population means fatalities by population rates for both Oklahoma and Tulsa counties are some of the lowest in the state. 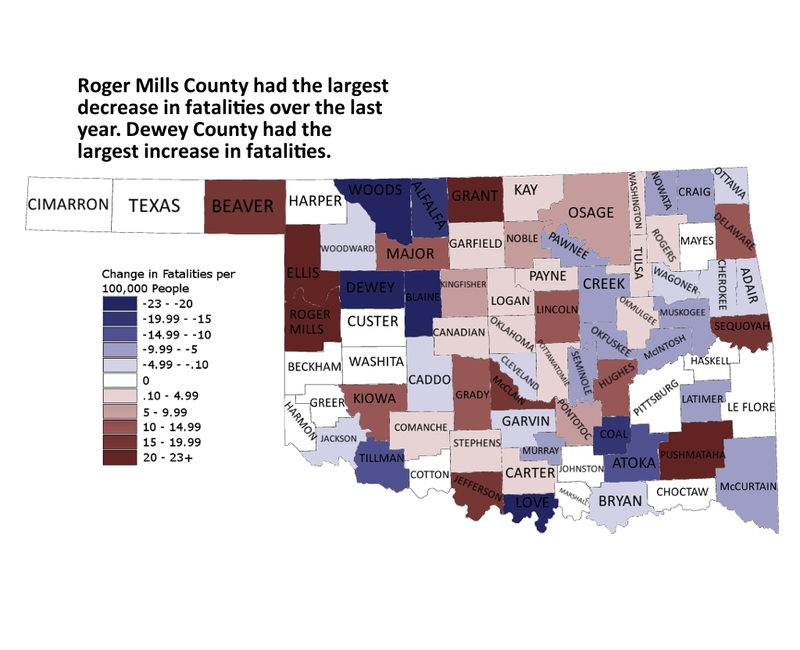 Although Roger Mills County remains on the top of the fatalities per capita list, this year they saw the biggest decrease in fatalities, going from two to zero. Roger Mills County was not the only county to see a significant decrease in fatalities per capita. The drunk driving statistics show that Pontotoc County saw a -13.23 change in fatalities per 100,000 people with a change from six fatalities in 2010, down to just one in 2011. Conversely, both Dewey and Washita Counties have seen a dramatic increase, from zero fatalities in 2010, to three fatalities in 2011. While the relatively low populations of these counties have contributed to their substantial rise in per capita fatalities, any increase is cause for concern.Despite the overall decrease in injuries, the lack of change in fatalities since 2010 demonstrates how pervasive and dangerous drunk driving remains in Oklahoma. At McIntyre Law, our mission to improve safety and help protect the rights of car accident victims across Oklahoma, means that each year we hope to raise awareness statewide with these drunk driving statistics. There needs to be an active and productive dialogue about how we can fix this problem. If you or a loved one has because of a drunk driving accident, and you need the help of a personal injury lawyer, please contact us for a free, no-obligation consultation.